Nan-Yao Su, professor of entomology at the UF/IFAS Fort Lauderdale Research and Education Center, is the world authority on the behavioral ecology and control of subterranean termites. Subterranean termites cost U.S. consumers more than $1.5 billion annually to control, and are a primary concern for homeowners in Florida. Through a mark-recapture technique Su developed, he determined that a single colony of subterranean termites may contain several million workers that forage up to 300 feet for food. Despite applying a large quantity of insecticide, conventional soil treatment only deters termite attack, leaving the vast majority of subterranean termites unaffected. After discovering that an insect growth regulator, hexaflumuron, caused delayed mortality of termites, Su developed a monitoring/baiting procedure to deliver hexaflumuron to field populations of subterranean termites. 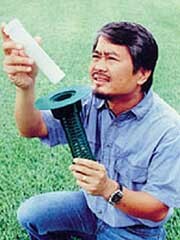 With this technique, he demonstrated that the entire colony of several million individuals could be eliminated using less than 1 gram of hexaflumuron. The procedure is now commercially available to the public, under the tradename Sentricon, and is expected to drastically reduce insecticide use in future termite control. This non-invasive baiting procedure is also ideal for environmentally sensitive historic sites such as the Statue of Liberty National Monument. For his contribution to the development of this new technology, Su received the U.S. Secretary of Agriculture’s Honor Award for Individual Achievement in Research in 1996.